While climate scientists like Penn State’s Michael Mann and NASA’s Gavin Schmidt were less than convinced by Reed’s approach to attribution, there’s wider support for his emphasis on flooding as the most significant impact of slower-moving storms. “Though Florence did not arrive with winds as violent as once feared, forecasters got the storm surge and rainfall correct,” the Post states. “They have made clear that this event is all about the water—which the storm has delivered in devastating quantity. The U.S. National Weather Service warned that flooding would likely last weeks, producing “a perilous moment for the hundreds of thousands of people who took to the roads to escape the storm’s fury” at a moment when most rivers were still several days from cresting. With the region already saturated by summer rains, the Weather Service expected more than a dozen major rivers in the Carolinas and southern Virginia to flood, with several of them setting records. On Friday afternoon, the storm was moving at just three to five miles per hour. 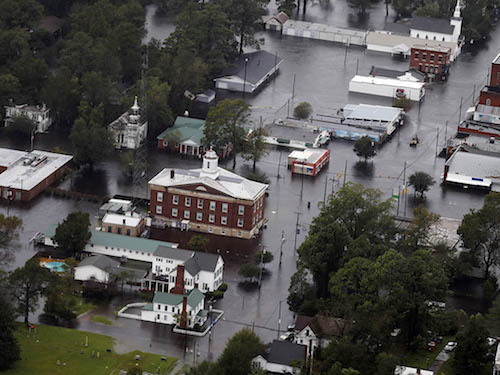 The Post says scores of people had to be rescued from their homes in New Bern, NC, where the downtown was “literally underwater”. Utility Duke Energy predicted one to three million power outages and warned it could take weeks to restore full power. “The storm is wreaking havoc on our state, and we’re deeply concerned for farms, for businesses, for schools, and even for whole communities that might be wiped away,” said North Carolina Governor Roy Cooper (D). South Carolina had never before seen “a hurricane staying on top of us for this long,” said Governor Henry McMaster (R). Over the weekend, the New York Times said rainfall in North Carolina had already broken a state record, 12 deaths were confirmed, and local, state, and federal officials were “rushing to rescue people stranded in half-submerged homes across the region”. The Post warned the storm was “far from done” and predicted record-setting rains and catastrophic flooding. The Return to Now blog reported that North Carolina hog farmers were “scrambling to drain thousands of toxic manure lagoons, some the size of lakes, before they overflow into drinking water and the growing ‘dead zone’” off the coast.” As the biggest turkey producer, the second-biggest pork producer, and the third-largest chicken producer in the U.S., “North Carolina’s factory farms produce more than 10 billion pounds—or 15,000 Olympic swimming pools’ worth—of wet animal waste per year,” the blog noted. “We have 62 hog farms that still remain in our 100-year flood plain, along the Neuse River, which are always at risk of flooding anytime a major storm comes through,” said Neuse Riverkeeper Katy Langly. While technologies can somewhat reduce the volume of pollution from factory farms, the true solution is to “move back toward sustainable agriculture,” she added. And while front-line responders tried to cope with a growing, slow-moving disaster, the Washington Post reported that FEMA Administrator Brock Long, a well-respected emergency management professional, might soon be removed from his post over a spat with Homeland Security Secretary Kirstjen Nielsen. “The prospect of Long’s dismissal has alarmed current and former staff at FEMA and DHS, and it has captured the attention of officials on Capitol Hill, who note that the agency’s No. 2 position has been vacant for nearly two years and that Trump’s current nominee, Peter Gaynor, still awaits Senate confirmation,” the paper noted.